Hoops in the Hood Officially Kicks Off with Summer of Opportunity Event - BUILD, Inc. Hoops in the Hood is about to have its biggest summer ever. The sports-based community safety initiative by LISC Chicago creates safe spaces for youth to interact and build positive relationships with peers and caring adults while making visible use of public spaces and fostering a sense of community. Over the last 12 years, it has positively impacted thousands of Chicago kids and given them a safe place to play across the city. Founded in 2006, Hoops in the Hood is a summer basketball program currently in 15 neighborhoods, many of which block off “hot-spots” for games. 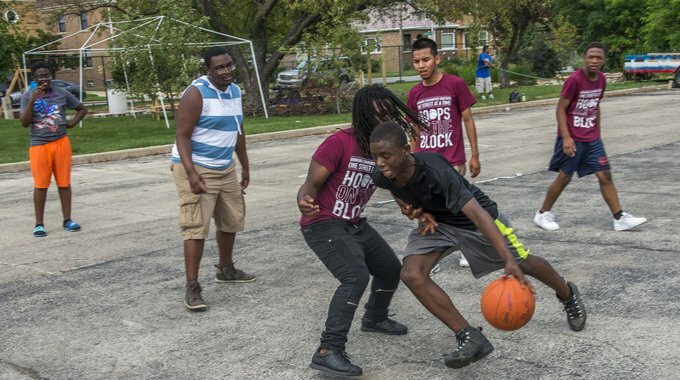 The initiative, which runs through August, has already started in some communities and on June 22 Hoops in the Hood partner BUILD Chicago will host their “Summer of Opportunity” event that will close down all of Columbus Park in the city’s Austin neighborhood. Editors Note: This event has been postponed to August 17 due to weather.